One Peace 6th Year Anniversary! Hello everyone! We have made it six years as of this weekend! One Peace has been such a big part of my life, and I can’t tell all of you how happy I am to see that the community is still here playing on the server. Even though we do not have as many people as we use to in game, everyone keeps in touch over discord. It has been fun meeting new community members and talking to veterans who pop back in every now and then. With out any of you there would be no One Peace. So, thank you for being part of our community. I would like to also have a shout out to the staff and thank them for all the hard work they do with keeping the server running as smooth as possible when I am not around to do so. Minecraft eventually will die out over the years, but I hope we are all still part of this community and move on to the next big adventure game together! As for now though, Minecraft is not going anywhere soon, and all of us still have a good time playing it. So, for the anniversary of the server We will have a lot going on to keep everyone busy and to get involved with lots of fun events. For starters everything in the donation shop will be 30% OFF everything all weekend. No code needed. We will also be giving away $180.00 worth of prizes on Saturday! Read below for details! In discord you will notice we added a channel to post photos you may of taken in the past of builds or fun memorable times you had on the server. So be sure to share the best memories you got! you may post a photo or type some thing up to share. We can't wait to see what everyone writes. In the Christmas Town You will be able to trade in hats or tokens you did not want for more snow ball tokens to get what you do want. Also There will be more amiibos hidden! So keep your eye out for more amiibos to rock on your shoulder. Prize: The box of coal your Secret Santa got you! 8:00pm EST to Midnight – Discord Karaoke Party! Prize: Anyone who sings gets a spawner or god item of their choice. Today we have brought back one of the main attractions to One Peace. We have brought back the custom items and mobs! How is this possible in Minecraft you may be asking? 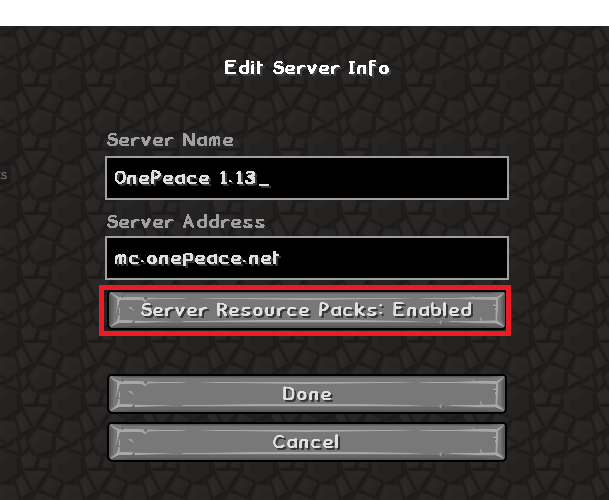 Simple, we have our own home-made Resource Pack that overlays your Minecraft client. Some questions you may have are listed below. How do I get the Resource Pack? 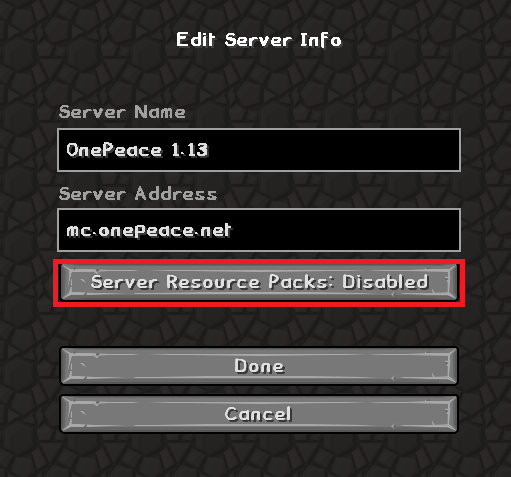 Will this break my other Resource Pack that I am using? No this will not change anything of your current Resource Pack, or default Minecraft. It simply adds items and mobs. I keep crashing when trying to join the server, HELP! If I choose not to use the pack? If you choose not to use it, then you won’t see any of the cool custom items and some mobs we have added to the game. Overall, this won’t affect your gameplay, but will affect your full experience of the server. I still have questions about the pack where can I ask these? You can ask a Staff member, or you can post your questions or concerns to the forums. The Christmas Town is back with a whole lot of changes! Not only have we added a whole new section to the Christmas Town, but we have also added a full list of custom holiday mobs this year. Each mob has unique drops and rare collectables to show off to the community. On top of that, we have brought back the traditional scavenger hunt for the amiibos. This year, we have a total of 75 amiibos to find and collect. How do I get to the Christmas Town? December 1st at midnight, the warp will open to the public for the whole month of December. What Mobs will I see In the Christmas Town? You will find Polar Bears, Elfs, Gingerbread Men, Yetis, The Grinch, Princess Elsa, and more! What is a Snowball Token? A Snowball token is used to trade in for amiibos hidden around the Christmas Town world. What Amiibos am I able to find this year? This year is Veteran Themed. We did our best to contact all the Veterans of One Peace to have them take time to create their amiibo for players to collect them in game. You will also be able to collect current staff amiibos, and One Piece anime themed amiibos around the world. Why do some Amiibos require an additional token? Veteran, One Piece, and Rondo’s new Amiibo will require an additional token to make the challenge a bit more interactive and encourage players to kill all the mobs. Why does Rondo get a new amiibo every year? Rondo gets a new amiibo each year because he was the first amiibo created on One Peace! What do the custom mobs drop in the Christmas Town? If I die will I lose my items? No, Keep inventory is enabled in this event area. Christmas Crackers are back and are full of new items you can share with your friends! The crackers are available in the donation shop for the entire month. In order to use your Christmas Cracker, you must go up to another player and crack it over their head. You and the player you cracked the Cracker with will receive random items. The items in Christmas Cracker are random, with a chance at getting Holiday scarfs to keep warm, and Party Hats for the new year! In addition to the Christmas Crackers, we will also have Santa hats you can get if you donate $50 or more in the shop this month. The build contest this month is anything you want to build! We want to see the best work you can do. The build must be built this month and contain at least 500 blocks minimum. There is no limit to what you can build as long as it follows the rules of the server. Builds must be done and submitted by the 23rd of December. Voting for the contest will end on the 31st. As always, the top voters of the month will receive the same prizes as the build contest winners this month. If you have any questions please feel free to ask us on discord, or post to the forums! Rank Upgrade (not for Elite2 rank) Plus 2nd and 3rd Place Prizes! If you played on the 1.12 server and donated for custom items or earned them, please login to the old server and take a screen shot of the items in a chest of the ones you want brought over to the 1.13 server. Please try to limit it to one or two double chest full of items. you can post your screenshots Here. Once posted, an admin will help you recover your old cosmetic items. This month we are running a promotion with Twitch Streamer LessGains! He will be streaming throughout the week on the server to help promote One Peace. Please make him and his followers feel welcomed on the server and be sure to check out his stream! You can check out his Channel HERE! On top of that we will be running a 10% OFF Code in the donation shop throughout the whole month. You only can use this code once, so be sure to use it wisely! I know this was a lot to take in this month, but I hope everyone enjoys all the new content we added this month for everyone to engage in. Lastly, the Nether and the End have been reset too! If you killed the Ender Dragon and got the egg last month, let someone else do it this time! Other than that, enjoy One Peace’s Holiday season! Oh I almost forgot! Villager Spawners are back in action!